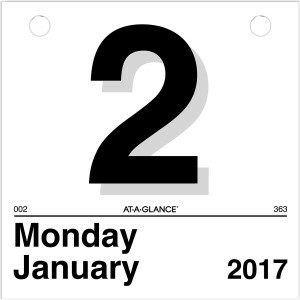 My favorite kind of calendar is those square jobs that dedicate their entire surface area to telling you what day it is, and nothing else. No pithy sayings. No motivational poetry. No graphics. No kittens and puppies. Just a big, bold number and the day of the week. Pure. Elemental. Basic. Every day is a fresh start. You literally tear off the day before and throw it away. There’s something cathartic about leaving the past behind in such a hands-on, mechanical way. And now with only two sheets left—today and tomorrow—it’s a reminder that 2016 is also about to enter the dustbin of history, inspiring me to look back on my year. But with all my calendar pages in the landfill, how am I to do that? 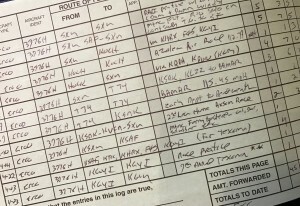 Luckily for me, we pilots are required to keep a log of all of our flights to prove training, experience, and currency. I poured a second cup of coffee and sat down at my desk and began to slowly flip though the green pages of the log. In 2016, I filled four pages of tightly spaced lines with tiny, cramped, handwritten script. The logbook records 252.9 hours of aerial adventures for the year. Is that a lot? Well, it depends on who you are. An airline pilot would probably fly that much in a few months (they are limited to 1,000 hours per year); while the average for general aviation pilots nationwide is 35 hours a year—although that figure includes people like me who fly more, so the typical pilot flies a lot less. My eyes slid slowly down the columns of scribbles, and as I reread the brief, Tweet-like entries, the flights came alive for me again. The blue sky above the canopy. The dull roar of the engine through my headset. The throb of power that pulses through the airframe. The sun twinkling off the waxed surface of the wings. And the magical feeling of slicing through the air in defiance of all logic, levitating above the ground in a metal object that weighs over a thousand pounds. 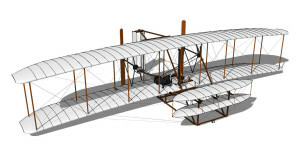 The year’s first flight was on January 8th. My logbook shows I ferried Tessie back from maintenance in Santa Fe. My logbook notes the plane was, “hot and fast,” complete with a smiley face, but I see the flight time was nearly two hours—twice what was needed. I must have gone sightseeing on the way home. No big surprise; the previous flight was five weeks before. She had been in her annual inspection and I must have been thirsty for the sensation of flight after such a long dry spell. 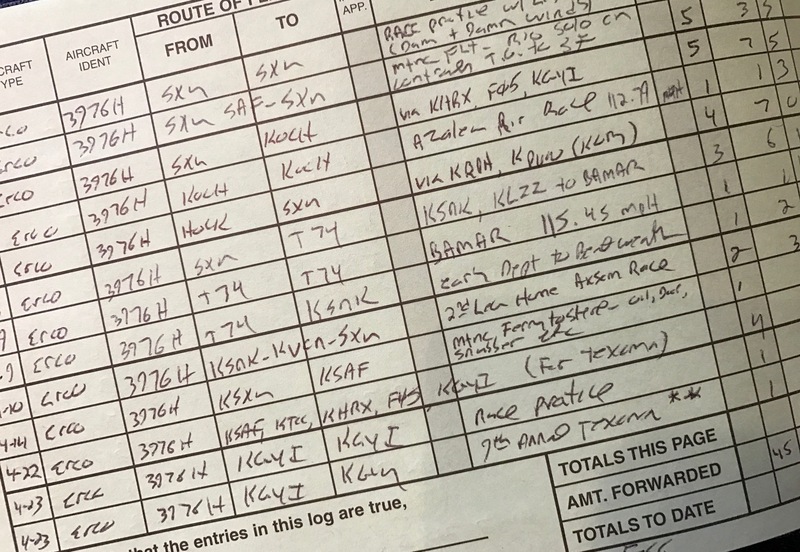 My logbook ends the year yesterday with a flight to nowhere. I went up and practiced race turns near our home airport so I wouldn’t get rusty in the off-season. Rio came along with me but stayed on the ground learning to fly his Christmas toy drone inside the empty hangar next to ours. In between these bookend flights are endless adventures. The first, if you missed it, was an early January beer run of sorts to Kansas, flying low and hot to break in a new engine cylinder. The following month, in February, we flew up to 10,000 feet, just to prove we could. Then I flew Rio to his flying lesson (he had taken up gliders), although later in the year he decided that airplanes without engines weren’t right for him. March saw race practice, and in April it was off to the far eastern borders of Texas for our first race, a 7.5-hour flight. It was followed by two more the same month. May saw us flying over the Gulf of Mexico on a race trip that logged 22.6 hours in the air with the commute to the race, the practice run, the race itself, and the flight home—all in five days. It also was the month a speed mod went south on us in a big way. June had me racing down the Mississippi River. Literally. And then turning around and flying across the Rocky Mountains and up to Washington State. I was in the air 12 days that month. It was heavenly. Naturally, in July we took the required pilgrimage to aviation’s Mecca: AirVenture at Oshkosh, Wisconsin. In August we were on display at the state’s largest fly in, but it was a slow month for flying, with few hours logged. September saw us flying to the west twice, once for an air race in Arizona and the second time for a race in the southern Colorado Rockies. On that second flight I spent a lot of time in the plane, but very little time flying it, being stranded by weather at a desolate unmanned airstrip in the middle of nowhere. October is the scantiest month of the year in my logbook, with a paltry 1.1 hours logged. What’s up with that? The remark on the flight of October 3rd is, “break down.” Yeah. Our girl sat out the month in Clovis, not even 100 miles from home. With the coming of November we were in the air again, to Grove, Oklahoma, and down into southern Texas for races, then wrapping up the month helping the family student pilots practice their landings. December was more practice, race practice for me, pattern work for Lisa, and landing practice for Rio. It was a good year. Next week, at the start of the New Year, it’s off to Santa Fe to drop Tess off for her annual inspection, bringing us full circle. Time for a new calendar. Time for a new logbook page. For you non-pilot readers (I love you!) there’s a thing called weight and balance we pilots are supposed to do before every flight. It’s a series of mathematical machinations that are used to make sure the plane is not too heavily loaded and that whatever load it’s carrying is positioned so that the aircraft won’t be too nose nor too tail heavy to fly safely. In the old days we used complex charts, slide rules, and pencil and paper to confirm that we were safe to fly. Now there are a slew of modern electronic options and apps for the purpose. Is this really necessary for the small, car-like planes most of us fly? Damn straight! Most four-seat airplanes can’t actually fly with four people, some baggage, and full fuel—so this becomes important. Even the Plane Tales Plane is incapable of flight with two of us onboard and all three of her fuel tanks full to the brim. For us at Plane Tales, it’s really all about the weight. As a two-seat, side-by-side airplane, the balance side of the equation for Tessie really doesn’t come into play as she has no backseat. I just need to make sure that no more than 75 pounds of baggage goes into the luggage compartment and I’m good to go on balance. Weight, on the other hand, has a huge impact on us, but perhaps not the impact you’d expect. We can actually pack the plane to her gills if we want to, but if we do, we won’t be able to go very far. In the Plane Tales Plane, as we burn something in the neighborhood of six gallons per hour, each gallon of fuel gives us 10 minutes of flying time. At our current performance, in no-wind conditions, that gallon of gas will take us 18 miles. It doesn’t sound like a much. And it isn’t. For six pounds. But consider what a typical travel suitcase weighs. The airlines cap carry-on luggage at 50 pounds per bag. Putting a 50-pound suitcase in Tessie would reduce her range by one hundred and fifty miles! This is why we are the kings of packing light. Every ounce we save lets us fly farther without refueling. Refueling is kinda fun, because you see all kinds of places you’ve never seen before, but it’s always time consuming with approach, pattern entry, landing, taxiing, talking to the airport bums and answering the obligatory “does your ‘Coupe have rudder peddles” question. (She doesn’t.) Plus, many times there simply isn’t an airport where you really need one, so a cross-country flight can become a serpentine zigzag affair resulting in the elapsed travel time of an oxcart. So if we really need to get somewhere far, far away, we need as much gas in the tanks as we can safely muster. Now, I need to divert from our course to talk about my wife. She actually enjoys flying. At least now and then. For short periods of time. When the air is absolutely calm. And when I’m content to limit the bank angle of turns to about five degrees. The rest of the time, visions of fiery crashes dance in her head, and she pictures Rio an orphan. Accordingly, she’s the least-flying member of the family, and because of that, I’m never 100% sure how much aviation lore and knowledge is actually in her head. But recently, I learned that, in her quiet way, she has been paying close attention. Second diversion: There’s nothing that I enjoy more at the end of a long day than a nice glass of red wine. Or two. And sometimes three. This is a mission easily accomplished at home. But during the last race season we had some problems. There are dry counties that aren’t marked on aeronautical charts (they should be). There are strange liquor laws in some states about where wine can be sold. And on what days. And at what time of day. In short, wine shops proved to be in shorter supply than airports on our travels. Plus, there’s the problem of what to do with a partly un-consumed bottle of wine on the road. And sometimes the cost of wine in far-flung locations was more than the cost of the Avgas the plane was drinking. The obvious solution was to bring our wine with us as part of our luggage. But wine weighs. In fact, as a pure liquid, it weighs more than aviation gasoline. 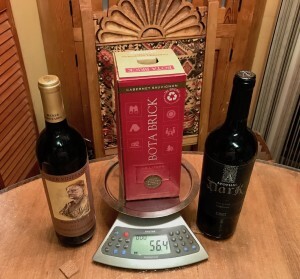 Wine tips the scales at 10 pounds per gallon. And worse yet, the typical packaging of wine is in glass bottles. And glass bottles are heavy. More on that in a minute. Bottles being out due to the weight and balance, I tried wine “miniatures” first. They come in both plastic and glass. I sent Debs to town with orders to find the plastic bottles. They were light enough but suffered the Goldilocks syndrome, with one bottle being too little, two bottles being not quite enough, but three bottles being too much. And traveling with a wine-drinking copilot the number of miniatures needed ended up requiring math harder than the most complex weight and balance equation. Next, I considered boxed wine, but the boxes typically hold the equivalent of four bottles of wine and were excessively heavy. I didn’t want to have to choose between wine and clothes. I’ve never flown naked, and I don’t see why one couldn’t (with enough sunscreen) but it would be excessively embarrassing (and probably illegal) at fuel stops. So the problem was one of those that seemed to be eluding a solution until the day Debbie came home triumphantly with something new. It was called a “brick” of wine, and sure enough, is about the size and shape of a typical construction brick. It held the equivalent of two bottles of wine, enough to fuel the crew for a typical cross-country. “How much weight do you think this will save over a pair of bottles?” she asked me. 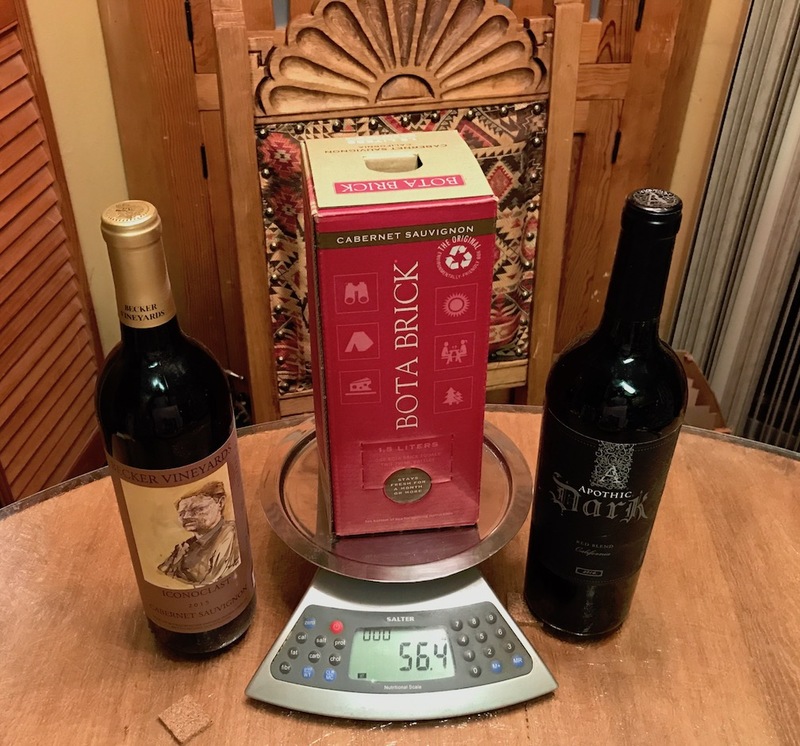 “Let’s find out,” I replied, and got out our kitchen scale and two bottles of wine. The pair of bottles weighed in at 5.7 pounds. The box at 3.5 pounds. Debs had saved us a full 2.2 pounds and added just a hair over six and a half miles to our range. My non-pilot wife had worked out the perfect wine and balance. Tomorrow flying—as we know it—turns 113 years old. According to Wikipedia, there are only 21 people left alive on the entire planet who were born before that day: December 17, 1903. The rest of us were born after heavier-than-air powered flight was a fact. Many an early barnstorming pilot considered himself Civis Aerius Sum, a Citizen of the Air. But really, in a world in which at any given time there as many as 10,000 planes in the air, we are all citizens of the air 113 years after wood, canvas, metal, and true grit first crawled into the sky. Of course, most people know the sweeping elements of the story of the pair of bicycle mechanics from Dayton who used the scientific method, experimentation, and even an early wind tunnel to unlock the secrets of the airfoil. And any pilot on the planet, and many non-pilots as well, recognize their iconic design in a flash. The wingspan of the Flyer is 40 feet, only two feet more than a brand spanking new Cirrus SR22. The Flyer’s length is 21 feet, nearly identical to Tessie—the Plane Tales Plane. The Flyer tipped the scales at 605 pounds empty, about the same as a modern Bush Cat light sport airplane. So while planes have undeniably grown up, they really haven’t grown larger—at least not in the general aviation category. Of course there’ve been some performance improvements in the century-plus since that first flight, (many of them made by the Wrights themselves). But in just considering the plane that started it all, the Flyer boasted a top speed of only 30 miles per hour, a speed at which few modern planes can even sustain flight. And her service ceiling—how high into the sky she could fly—was a paltry 30 feet. Most modern pilots get exceedingly sweaty palms flying at 30 feet. I can read statistics like that, but I can’t really get my modern aeronautical head around them. Nor can I truly envision a 12-second, 120-foot “flight” as being world-changing. It was so short, so brief, and so low, that the entire event could have taken place inside a modern airliner! By comparison, in my near-antique of an airplane that rolled off a factory assembly line just 34 years after Orville’s flight, I can fly 17,600 times the length of the jetliner, up to heights two miles above of the surface of the sea, at four times the Flyer’s maximum speed. And my performance is paltry compared to newer planes in the general aviation fleet. The speed of airplane development since the First Flight is nothing short of supersonic. We are truly blessed, and tomorrow every pilot should take a silent moment to thank the brothers from Dayton. And then we should take to the air to mark the occasion. I will.